The band started at the end of 2015, with Daniela Molina (voice) and Andrés Martínez (guitar, bass, voice), with the intention of creating a sound and aesthetic influenced by contemporary Japenese rap and pop, combined with electronic elements and a mix of trap and trip-hop beats. At the beginning of the next year, new members were added: Felipe Aros (violin), Alejandro Aros (vibraphone), Pablo Suazo (drums), Joaquín Cires (synth), Carlos Vásquez (bass) and Risho (beatmaker and programmer). On April, 2016, the band released their debut EP, titled "Hajimemasu (はじめます)". On January, 2017, they released their first videoclip using the single "Ponón". In the next two months, Daniela, Joaquín and Pablo left the band, and María Jesús Troncoso (synth and voice) and Luís Rodríguez (bass) joined in. Japanese culture has been an important influence in the taste of the members of the band, making it a huge factor that the band incorporates in their creative process. Manga, anime, movies, literature, and specially Japanese music are part of the collective imagery of the band. Artists like Shinichiro Watanabe, Daoko, Izumi Makura, Nujabes, Sotaisei Riron, Kinoko Teikoku, Tricot, among many others, have had a big impact on the band, as well as the music of anime series like Space Dandy and The Tatami Galaxy. 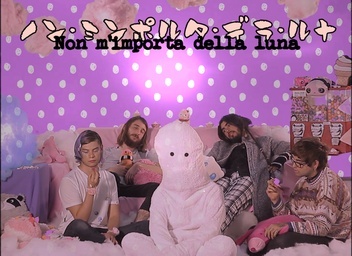 The visual aspects and aesthetic of the band has been influenced by the great work of Kyary Pamyu Pamyu.